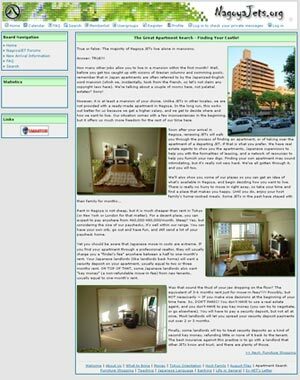 A web bulletin board and portal-like site that I created for my co-workers while working as an assistant English teacher in Nagoya, Japan. The raison d'etre of the site was to provide a way for everyone to communicate and pass along information, since we all worked at different schools throughout the city. Unfortunately all the work I spent on the site was sort of in vain, as no one really ever used the bulletin boards. Furthermore, a critical security flaw was discovered in the underlying BB code I was using, phpBB. Instead of fixing the security flaws, I just removed the bulletin board altogether and created a simplified version of the site to just display important information for new JETs coming to Nagoya. This information was really the most important part of the site anyway.